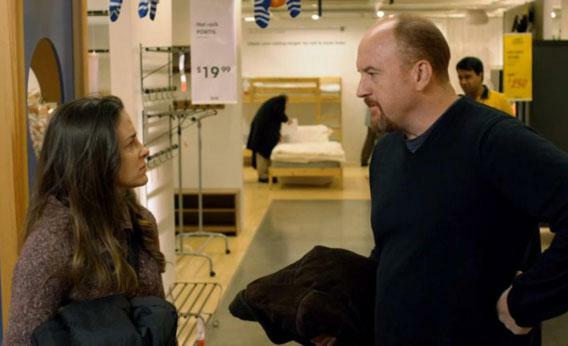 Louie recap: Louie’s past bum-rushes his present. Last week and this week had in common a single mother at Louie’s girls’ school imposing on him. Allison, you’re the only parent in this TV Club: Does this subject speak to you, generally? You must find yourself constantly entangled with other people with whom you’d otherwise have no contact or grounds for interaction, simply by virtue of being a parent. Strikes me as ripe comedic turf, and it certainly strikes C.K. that way. One tiny thing worth giving C.K. big props for: the water bottle, complete with shoulder strap, that Doris the piano teacher brings. What a nice bit of characterization. I imagine C.K. on the subway, seeing a woman with a water bottle on a sling, whipping out his notebook, and extrapolating a whole life for her based on that one detail. There was no way that the Maron exchange was going to rival the real-life WTF version, and while I would have loved to see a scene as tightly wound—as smolderingly, epistemologically strange—as last season’s Dane Cook détente, I didn’t mind the quiet encounter C.K. staged here. You can tie this scene, along the axis of an old dog trying/failing to learn a new trick, to the (aborted) piano lesson. Maron in his boxers was funny, and the payoff was excellent. Louie apologizes profusely and sincerely, but the feelings driving the apology, we learn, are ephemeral. This doesn’t make him a bad person, and indeed I like how C.K. builds a novel scenario around a pretty banal truth about dormant-verging-on-extinct friendships, and the scant amount of emotional and psychological resources we’re able and willing to devote to rehabilitating, sustaining, and reinvigorating them. What we see on the couch, as Louie watches Mark, is the flare-up of a guilty itch he can rub some shampoo on and forget about.